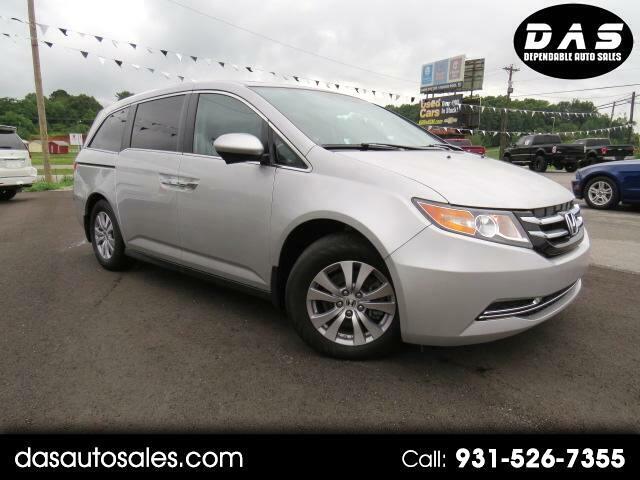 Start your adventure with our 2015 Honda Odyssey EX-L presented in beautiful Alabaster Silver Metallic. Powered by a proven 3.5 Liter V6 that offers 248hp while paired to a smooth shifting 6 Speed Automatic transmission for natural passing authority. Fun to drive, this Front Wheel Drive it will impress you with its confident handling, acceleration, and versatility while offering near 27mpg. After all, there's a reason this is the official minivan of carpool lanes and soccer fields throughout the suburbs! In fact, the Odyssey has earned the MotorWeek Drivers' Choice Award for Best Minivan and was named a Best Family Car by KBB. The aerodynamic exterior design of the Odyssey EX-L adds style as well as function. Get behind the wheel and experience the refined leather trimmed interior featuring a backup camera; you may think you're in a luxury sedan! Designed with your busy family in mind there are child-friendly power-sliding doors which help at school drop-off. Multi-adjustable second-row seats and a 60/40 split-folding third-row seat accommodate your growing family, and the cooler box is great for sippy cups! Mom and Dad will feel more relaxed with comfortable heated front seats and an audio system offering 2GB of digital music storage. Our Odyssey has earned superior safety ratings in its class due to anti-lock brakes, stability and traction control, and airbags that cover all three rows. Start your journey with this Odyssey as your family's mobile command center. Print this page and call us Now... We Know You Will Enjoy Your Test Drive Towards Ownership!